The Gallia Junior Fair gets into full swing July 30. GALLIPOLIS — With the Gallia County Junior Fair quickly approaching and set to kickoff July 30, what it takes to make a fair fun and safe is often a matter of much planning and preparation. According to previous conversations in years past with fair board members, the Gallia County Junior Fair property has roughly 250 acres of land and board members have said it was a “full-time job” taking care of the electrical issues, rerouting lines in old buildings and making sure flood waters had not damaged or made electric lines dangerous over yearly weather. Electrical work was first laid in the 1950s when the fair was christened in its current location with repairs made over time. Flooding safety has been a consistent concern of fair board members over the years. When water enters buildings, there is often mud and the first thing fair volunteers must do is hose all of that mud out and then disinfect the structure. Mike McCalla of the board in the past has said it was important to remove mud quickly or else it would dry and be more difficult to remove. In 2015, the fair brought roughly $3,000 of gravel to fill in holes and weak spots. The fair potentially uses around 500 tons of gravel in a year. It has also been estimated that two cubic 40-yard dumpsters are utilized on the property and are taken away at least once a day during the fair to be emptied. At the fair campgrounds, two cubic 20 yard dumpsters are taken. Stalls for livestock are typically cleaned and maintained a month before fair starts. The Gallia County EMS, along with area volunteer fire fighters and the Gallia Sheriff’s Office have often been present to account for the fair’s first response needs. 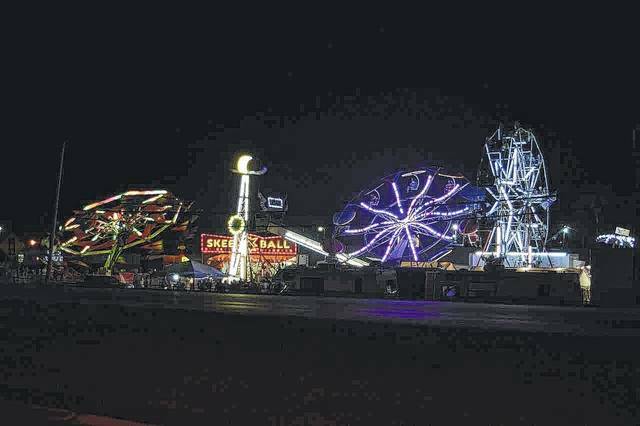 Gallia Junior Fair Board Secretary Tim Massie said, last year, after ride safety concerns during 2017’s Ohio State Fair, that at the beginning of each fair week, independent inspectors go to the local fair and inspect each ride after it has been assembled in its new location. Inspectors look for weak points in the structure of the ride, examine welds, hinges, moving parts, and any wiring. According to Massie, if any issues are found, any affected rides are shut down until the issue is resolved and inspected. Fair goers are encouraged to keep an eye on the ground as they walk. With wires and hoses being covered, there can still be tripping hazards if one does not pay attention. https://www.mydailytribune.com/wp-content/uploads/sites/42/2018/07/web1_7.21-PPR-Fair-6-1.jpgThe Gallia Junior Fair gets into full swing July 30.